Fantastic Private Pool House with 3 Bedrooms and 2 Bathrooms which has been stylishly refurbished and furnished by the owner and is ready to move straight in. It is a quiet residential village located in the East Side of Pattaya close to International Schools and Soi Siam Country Road with local markets, shops, international restaurants by walking distance within few minutes. There is a security remote gate to entrance to the residential area. This house is tastefully decorated in a modern style with spacious lounge with open plan and dining area. European style kitchen with good size kitchen counter top. Very clean and give you the feeling of cozy home. The house sale with fully furnished and air-conditioning in every room. 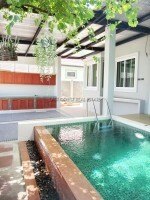 The house has a beautiful pool and garden area with patio, perfectly designed for relaxing away the stresses of the day. The title deed held in Thai name with tax and transfer fee to be split 50/50 on both parties.